I had every intention of writing and posting about another topic this week. However, I must share my experience. In my frustration last night and this morning, I decided today that I wanted to just be left alone from the world. Almost half the entire day, I just stayed in bed. Didn’t want to talk to anyone. Covers over my head, ignoring all messages. Didn’t contact anyone. Didn’t get on any social networks. I wanted to be dead to the world, so to speak, for just a little while. But during that time, I realized I wasn’t doing anything to help with my frustration. There was no resolve. All I did was think about the reason I was upset and what led up to it. I’m sure we’ve all been there. I then realized all my frustration was my fault. I couldn’t blame anyone else for the reason I was upset because of a decision I decided to make. I wasted hours of time that I could’ve used being productive, maybe in finding a way to resolve the issue. Nothing ever comes from worrying and dwelling on the negative aspect of an issue. All it does is waste time. When you run into an issue, a circumstance, or situation, don’t sit and have a pity party. Get up, move, and be productive. Do your best to overcome it. We can’t allow our emotions to get the best of us. Once they do, there’s no way we can move forward. We will be stuck if we don’t nip it in the bud right away. After some thought, I had to speak to myself. I then had to make another decision, I had to choose to keep moving. So I encourage and strongly suggest that when issues arise, you just keep going. Don’t soak in it, encourage your own self. 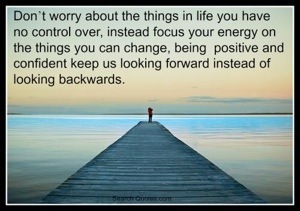 Think about all that you have to look forward to and move towards it. I’m glad you discovered this motto. No pity parties,worrying is just a regression about what happened. Life is 20% of what happens and 80% of how you react to it. It is our choice….